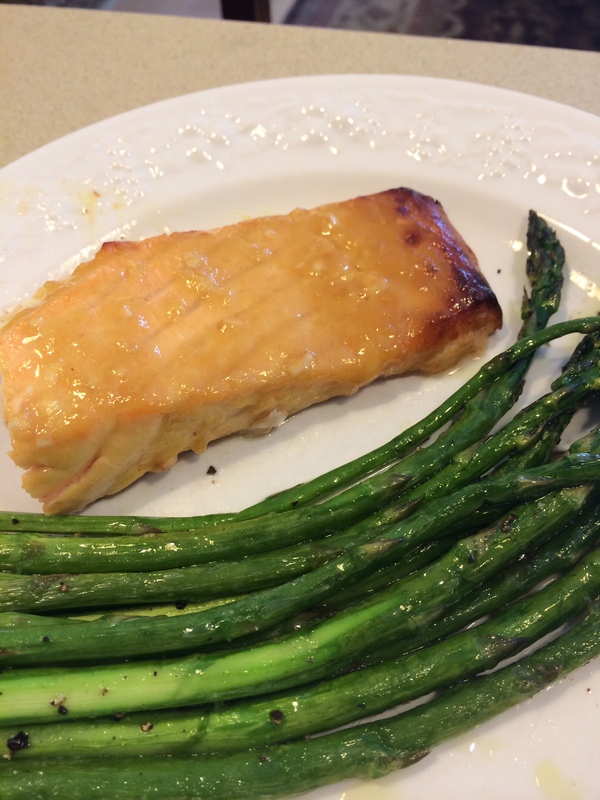 Sometimes you just need to lighten up the meal and I find Salmon always does the trick . It is filling without being full. Do you know what I mean? This Salmon dish is light but satisfying in every way. This is what I did and I hope you enjoy it as much as we did. I rinse the salmon off and pat dry with paper towels. Preheat oven to 400 degrees. Line a 15×10 baking dish with aluminum foil and spray with your favorite cooking spray. Place fish in prepared pan. Sprinkle with about 1/2 tsp. kosher salt over salmon and about 1/4 tsp. freshly ground black pepper–you will have to eyeball it but the salmon needs salt and pepper it’s a question of how much. Lightly sprinkle. In a medium sized bowl combine tomatoes, corn, oil , chili powder, cumin and a little more salt and pepper ( app. 1/4 -1/2 tsp. more salt and 1/4 tsp. pepper) Toss to coat. Spread tomato mixture around the fish in the baking pan. Roast uncovered, app. 15-18 minutes or until fish flakes easily and is cooked through. When fish is done to your liking remove fish to a platter. Brush fish with honey mixture. 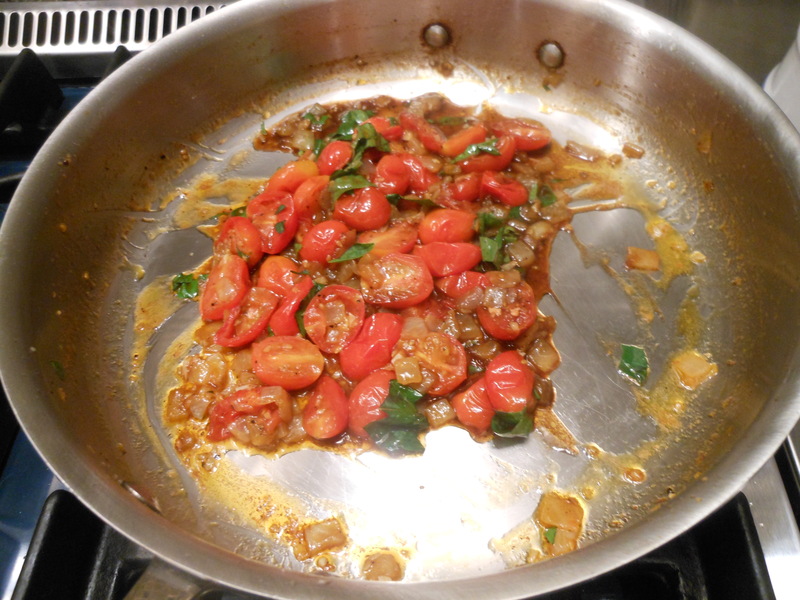 Add onion and cilantro to tomatoes in pan, stirring gently to combine all ingredients. Top fish with tomato mixture and if you’d like a little more cilantro this would be a good time to add it. 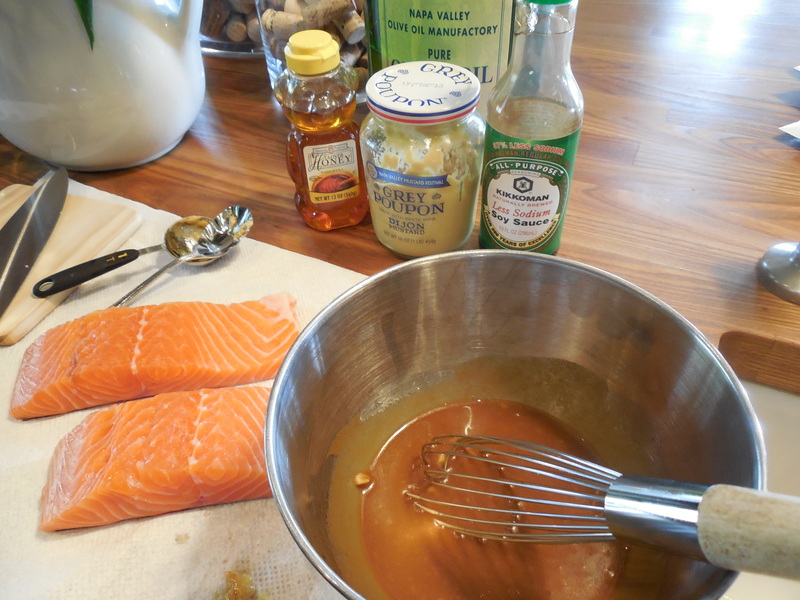 *this recipe for the sauce will serve 4 just increase the amount of fish you use. 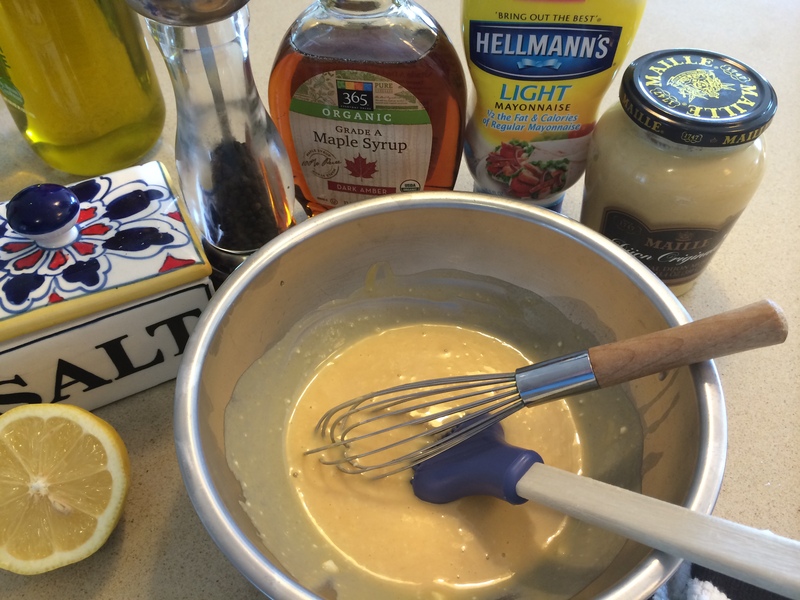 In a bowl with a small whisk or fork mix mayo, honey and Dijon till smooth. 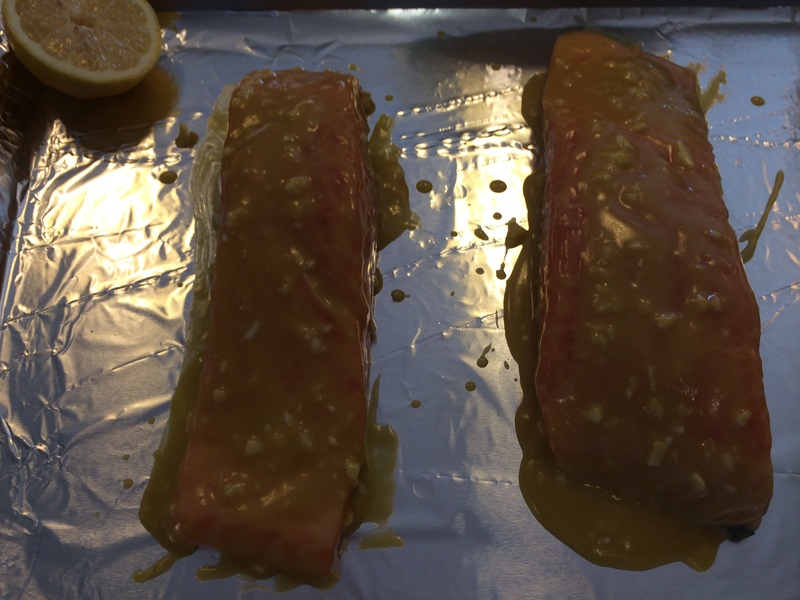 Pat dry the salmon filets with a paper towel and place on parchment paper or non-stick silicone sheet on a rimmed baking sheet skin side down. Sprinkle lightly with some Kosher Salt and Freshly Ground Black Pepper. Take about 1/2 of the mayo mixture to a separate bowl and spread all over the top and sides of the fish. Discard any of this remaining mixture. You still have the other 1/2 for extra sauce if you desire that you haven’t contaminated with raw fish!!!! this is important. I baked for 7 minutes and then turned oven to broil and did that for 7 minutes. Everyone has a different oven and of course depending on the thickness of the fish but check on fish by just touching it after the 7 minute bake, if it feels jiggly to the touch bake for another few minutes. All I can say is 7 bake and 7 broil worked out perfectly for me . ( check out picture) Fish should be opaque in the center and you can just easily check with a knife, but keep your eye on the fish so as not to overcook it. Always on the lookout for new Salmon recipes because Joel will eat Salmon and I think it’s such a good thing to try to eat at least once a week. I must eat it more often but he really is more “meat and potatoes”. He loved this recipe and I will definitely make it again and next time remember to buy the parsley. If nothing else it makes it look really good and definitely adds flavor to the fish. Joel probably wouldn’t like the green stuff but I would recommend using it. 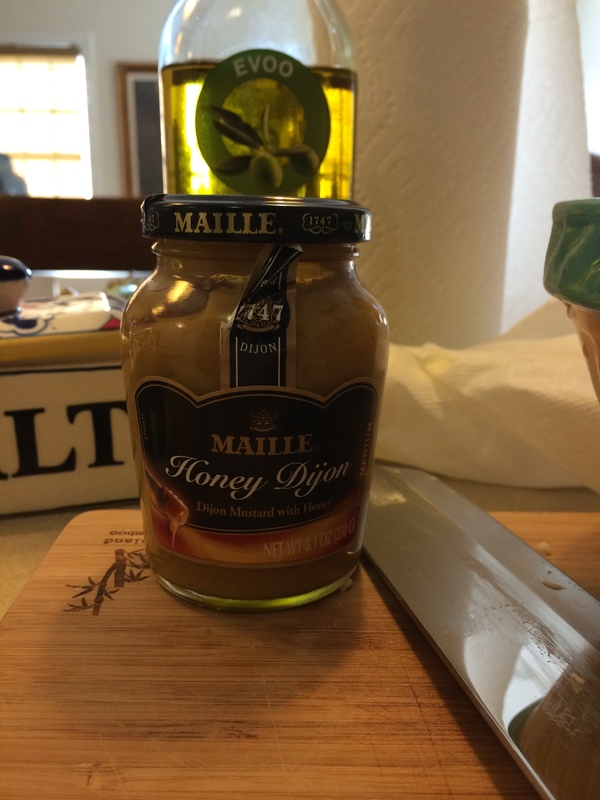 This is a super easy recipe and once again I used Maille Honey Dijon Mustard, it’s my favorite brand of mustard, try to find it. Enjoy! Preheat oven to 425 degrees and line a large baking sheet with foil. 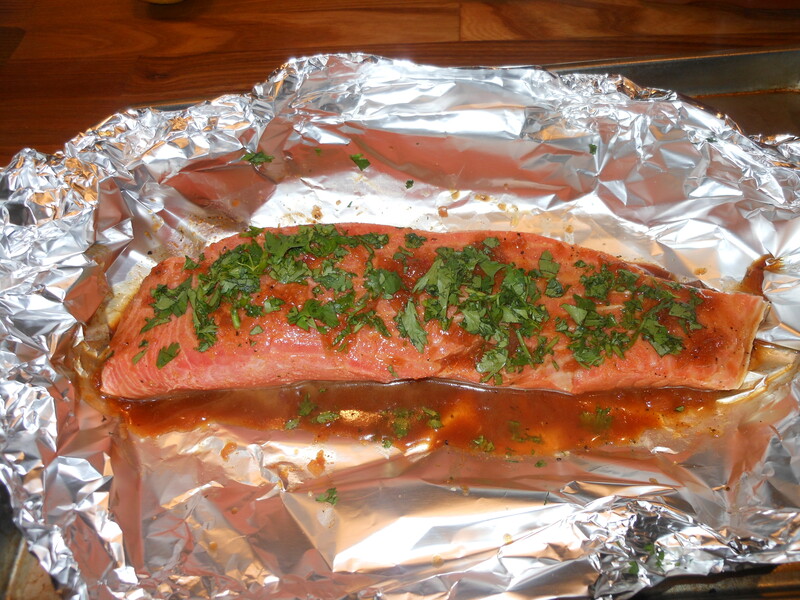 Place salmon pieces on top of the foil and set aside. I pat the salmon dry with paper towels first. 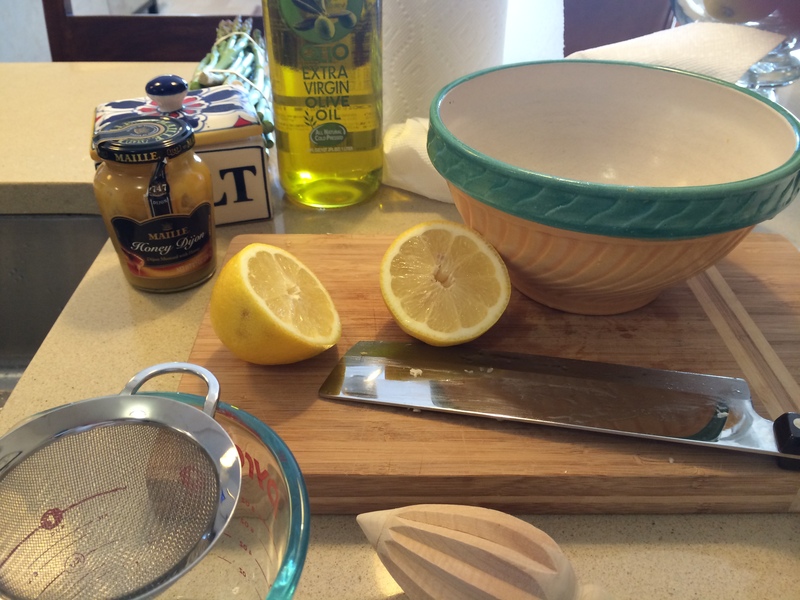 In a medium bowl, whisk together garlic, parsley, honey Dijon, lemon juice , salt and olive oil. Whisk well until well-combined then I used a pastry brush ( must have) brush on the sauce onto the salmon pieces generously Bake uncovered for 15-20 minutes depending on how thick the salmon is you may need to reduce the time by 2-3 minutes or increase it by 2- 3 minutes just keep an eye on it. Serve with your favorite sides. 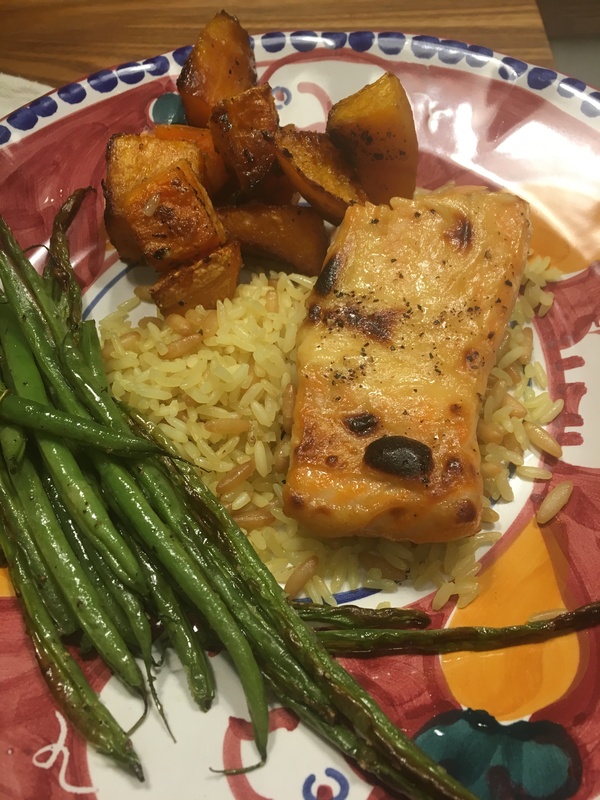 I served with Asparagus (for me) and roasted sweet potatoes. This is a go to salmon when I have no idea what to make but have already purchased the salmon. I almost always have all the ingredients in the house, it’s an Asian sort of style because of the predominant flavor of the soy sauce. 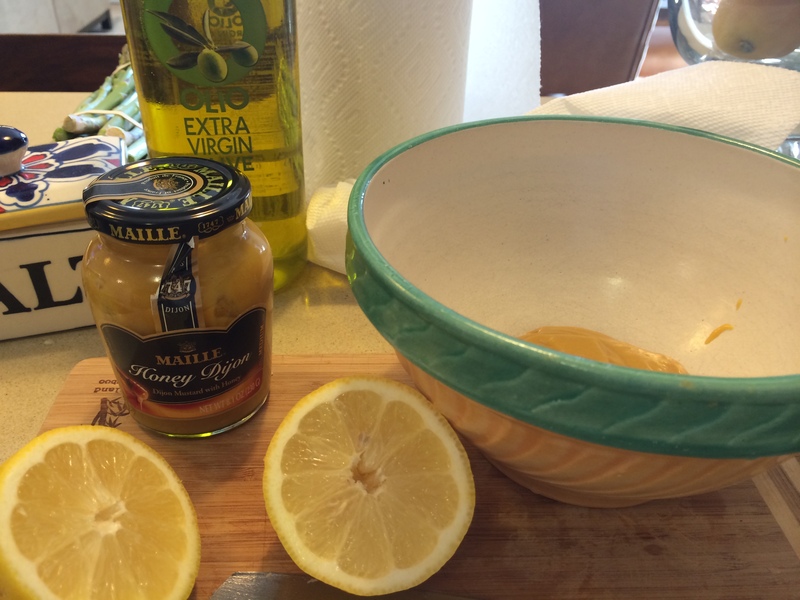 The honey and mustard give it a sweet and sour kind of punch, the garlic is just always good flavor to anything. This was our meal tonite with Green Goddess dressing and a BLT salad which I have already posted on my blog. This is a great meal for 1, 2 or as many as you’d like . 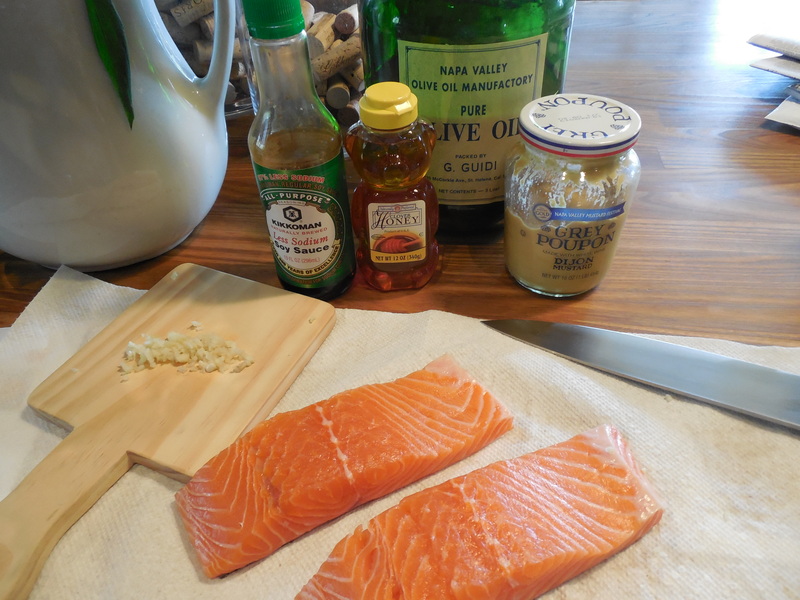 Recipe as is will easily be enough marinade for 4- 6 pieces of salmon. For just the two of us I buy a pound of salmon fillets with the skin on, 2 8 oz. pieces. I marinated for about an hour but you really only need about 20 minutes for flavor to soak in. 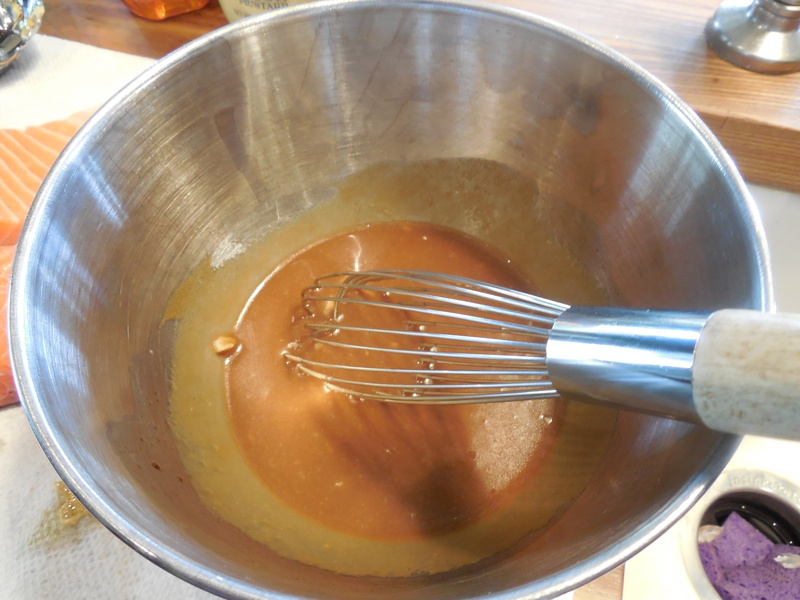 Whisk together the ingredients above. Drizzle about 1/2 of the marinade ( depending on how many pieces you have) onto the salmon and allow it to sit for at least 20 minutes. Preheat your grill to high, then I lower the heat to about medium-high. Place the salmon skin side down on the grill; discard any marinade that the fish was sitting in. Grill for about 4-5 minutes, depending on the thickness of the filet. Turn carefully with a wide spatula and grill for another 4-5 minutes. The salmon may be slightly raw in the center , but don’t worry because it will keep cooking as it sits. 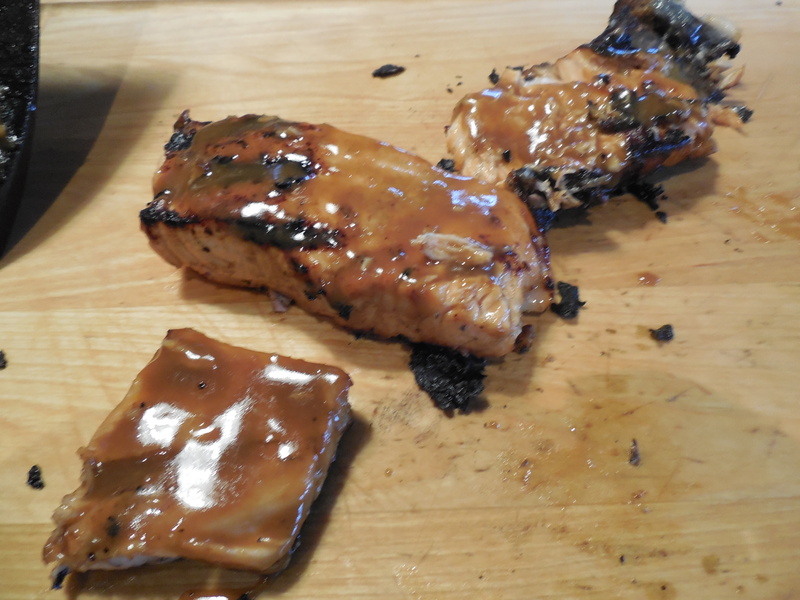 Transfer the fish to a plate, skin side down, and spoon the remaining marinade on top. Allow the fish to rest for app. 5 minutes before serving. We like it with the skin on but you may want to remove first before serving. This fish is delicious with rice and served warm off the grill, at room temperature and delicious the next day cold. Now if you don’t have a grill just put in a preheated 400 degree oven and cook for about 20 minutes, skin side down . 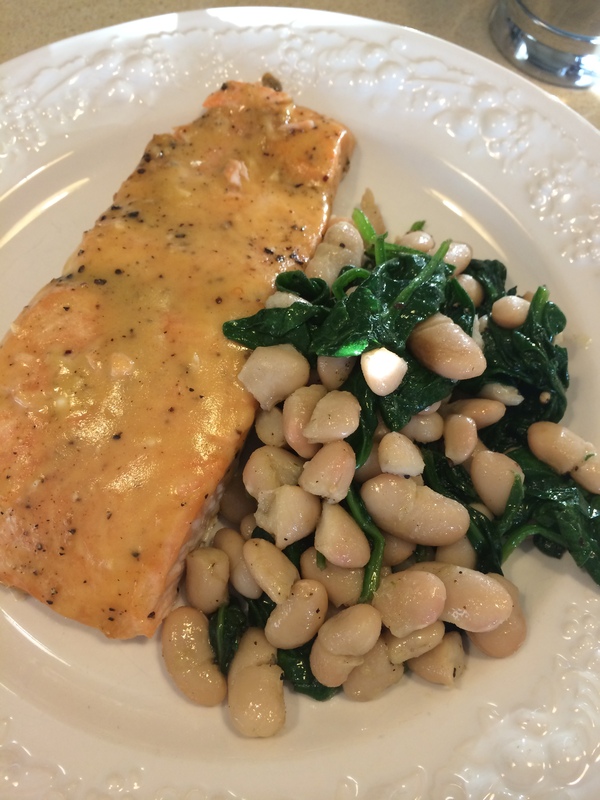 Just a wonderful weeknight dinner using Salmon right on the stovetop. Really delicious Tzatziki which is so super easy to make, it’s super fresh tasting and the herb flavor really comes through. I have many different sauces that I make and a few different tzatziki sauces as well but this is what I did this time. Original recipe comes from Giada De Laurentiis . I played around with a few ingredients but definitely got my inspiration for this one from her. It helps to have a fish spatula for flipping over salmon which I learned from my cooking classes with Karen Lee. Tzatziki sauce can be made a day ahead and chilled in the refrigerator. There will definitely be left over sauce , you’ll have enough sauce for at least 6 pieces of salmon. It makes for a delicious dip as well, and great served with grilled chicken. 2 tablespoons chopped fresh tarragon – I had trouble finding fresh tarragon so I had to add dry tarragon. I used about a teaspoon of dry, I would have really liked the fresh but couldn’t find it that day. 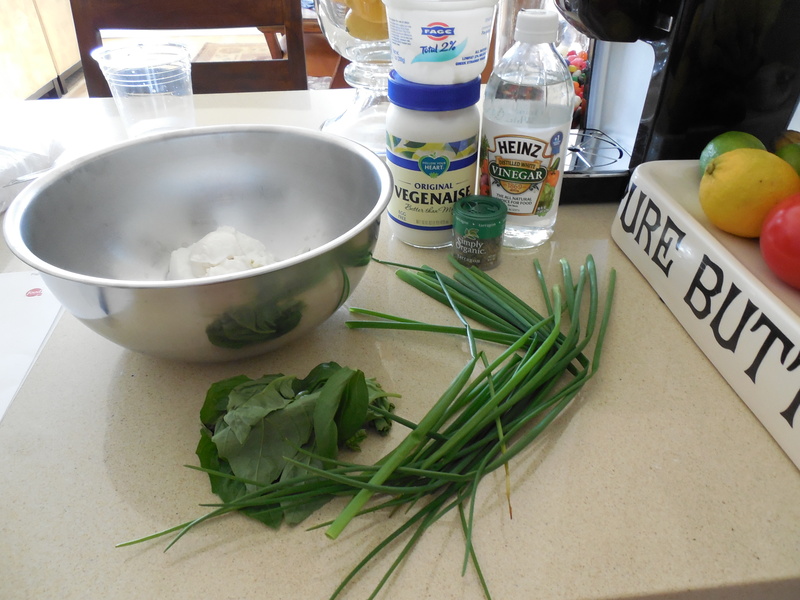 Combine the yogurt, mayonnaise, basil, chives, tarragon , vinegar , salt and pepper in a food processor. Blend until the herbs are finely chopped and sauce is a pretty pale green. Scrape the sauce into a bowl. Coarsely grate the cucumber using the large holes of a box grater onto a paper towel lined plate, pat dry and let it sit out and air dry for a few minutes. I used my mini processor and then let it dry on paper towels for a few minutes. Then mix the cucumber into the tzatziki. Add salt and pepper to taste. The tzatziki can be made one day ahead if you like. Pat dry the Salmon with some paper towels, then sprinkle the salmon with salt and pepper. Heat the oil over medium-high heat in a large skillet. 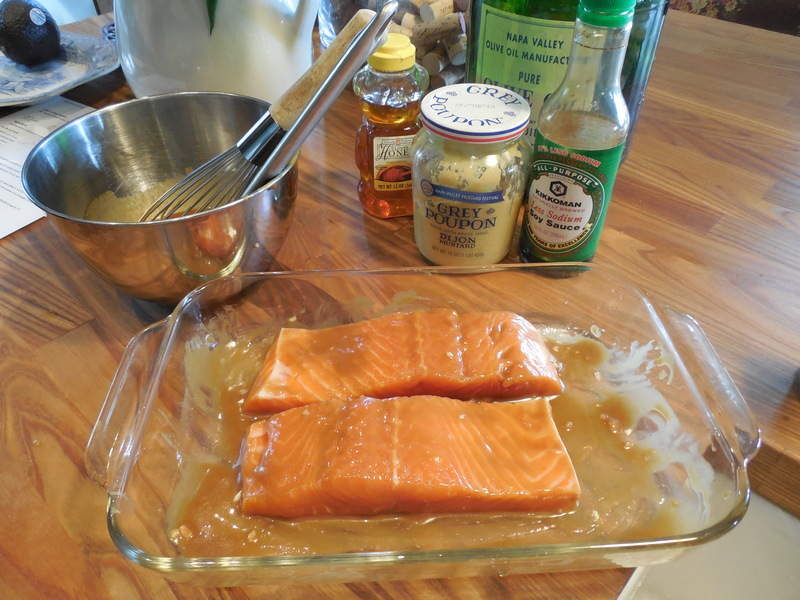 Cook the salmon, skinned side up , till it turns a golden brown, about 4 – 5 minutes depending on thickness of salmon. Flip the fish ( if you have a fish spatula this will be easier) and cook for another few minutes until done. It really all depends on the thickness of your fish. You’ll definitely need to turn on the exhaust fan for this one. Serve warm, at room temperature or even chilled with the tzatziki. Yum! I served with roasted asparagus . I found this recipe in Ina Garten’s new cookbook, “Foolproof”. It’s super tasty and not difficult at all. I own a cast iron skillet so I used that for the salmon. I suppose if you don’t have one you can just use any skillet as long as it’s oven proof. 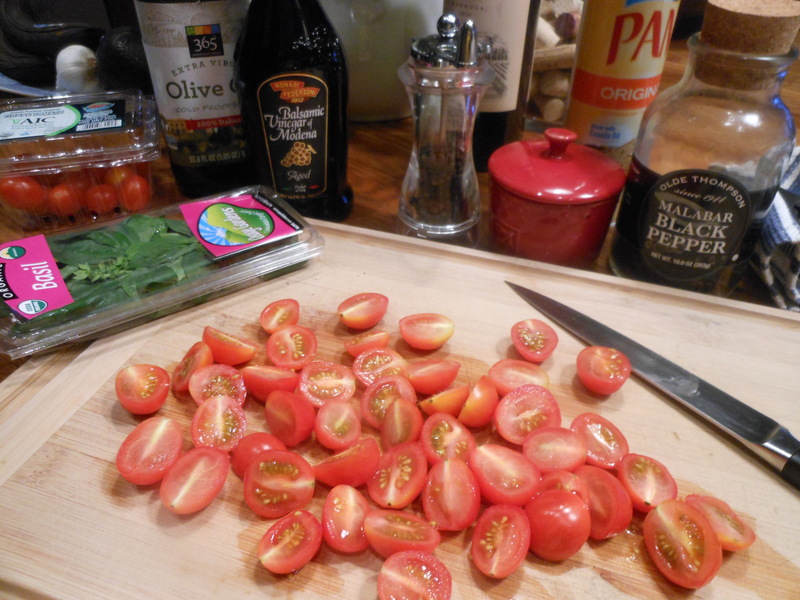 The pairing of the balsamic vinegar with the tomatoes and fresh basil over the salmon was delicious. I highly recommend this if you love salmon and don’t mind the 2 pan thing. Since I don’t grill that much in the wintertime in CO this was a perfect alternative. The salt and pepper and little olive oil gave the fish a very nice crust. Make sure you have a metal spatula to lift fish up and turn over in pan. I love my cast iron skillet, and they are super affordable and make a real difference. Lodge brand is the one I use. I roasted potatoes as a side dish. 1 pint cherry or grape tomatoes, cut in half. * this recipe is for 4 people , I made it for the 2 of us and just cut in 1/2. Heat 3 tablespoons of olive oil in a medium saute pan. Add the onion and saute over the medium-low heat for about 5 minutes. You’ll want onion to be soft but not browned, stir occasionally. Add the garlic and saute for another minute. Stir in the tomatoes, a scant teaspoon of kosher salt, and 1/2 teaspoon pepper. ( You can adjust the salt to less if you like) . Cook tomatoes over medium -low heat for about 15 minutes, stirring occasionally, until the liquid evaporates and the tomatoes thicken slightly. Off the heat, stir in the balsamic and basil. I layed fillets out on paper towels, brushed all sides with olive oil, and sprinkled with salt and pepper. I then placed skin side up in the cast iron pan which I pre – heated for about 5 minutes. Cook the fish for about 4 minutes, don’t move them . Turn the salmon skin side down with a metal spatula . Transfer the pan to the oven for about 6 minutes. Remove the fish , make sure it’s cooked through, and place on a serving platter and cover with aluminum foil, allow to rest for at least 5 minutes. It will continue to cook for a bit after you remove it from pan. 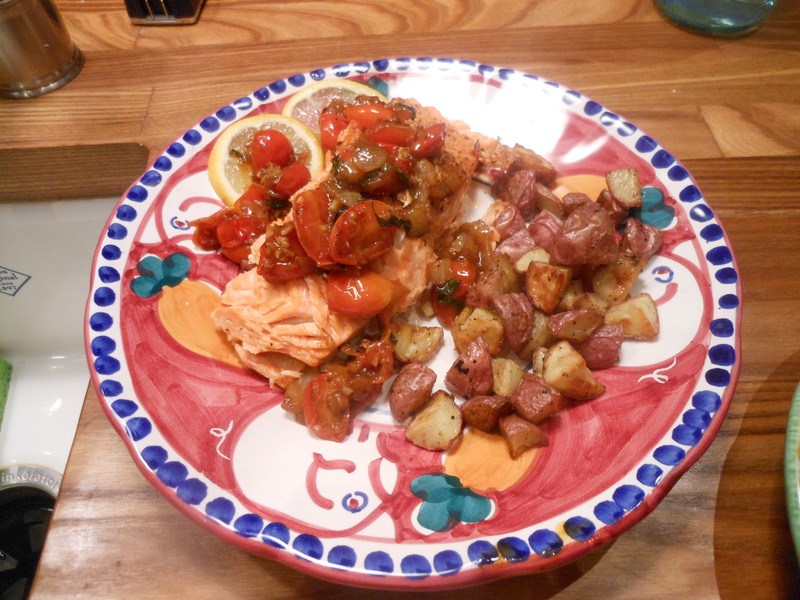 Reheat the tomato mixture, season to taste, and serve along the salmon. You can serve at room temperature, hot or warm. Always on the prowl for new recipes for Salmon. I usually cook it on the grill in the summer but this could easily be cooked indoors if no grill available. I actually cook this on a piece of aluminum foil on the grill, it really is like an outdoor oven. You can use a basket but I always find it makes such a mess. Whatever works for you, when I have placed fish right on grill it’s just a disaster, so I’ve taken to doing it this way. I played with these ingredients for the marinade and you know I took liberties with the cayenne pepper, so just put a sprinkle if you don’t like it too spicy. The marinade thickened up and it was perfectly delicious with a sprinkling of fresh cilantro. Cilantro can be eliminated but we love it, so it stays on in this house. 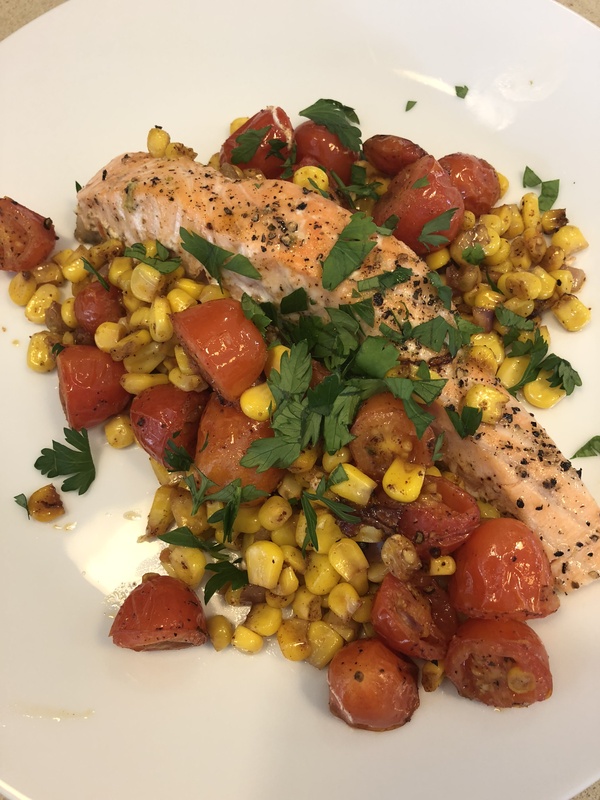 I had some leftover ears of Grilled Corn so I threw together a very impromptu Corn Salad which is listed below as well. In a small saucepan, melt the butter. Add the shallots and saute until softened. Add all the remaining ingredients, except for the cilantro. Cook over medium heat until slightly thickened, about 10 minutes. Remove from heat and add the cilantro. 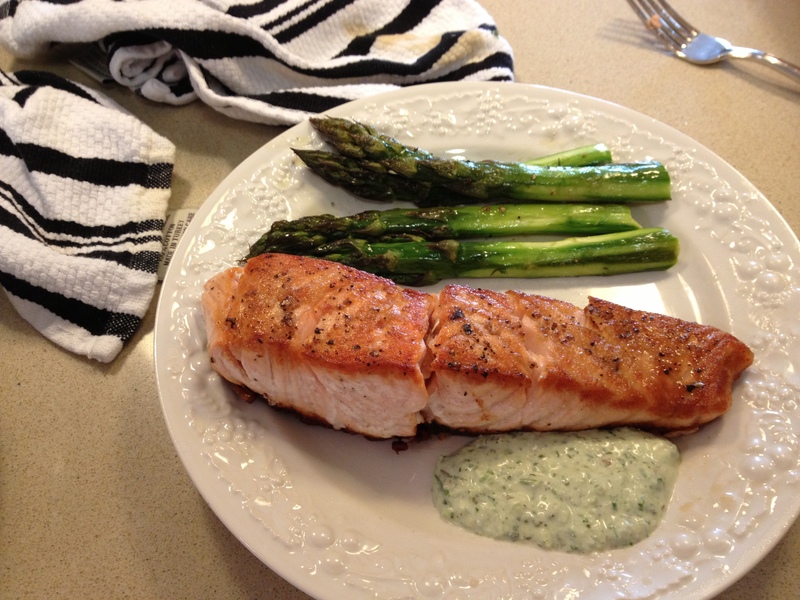 Baste the salmon filet with a bit of the sauce and preheat your grill to a medium high heat. I placed the salmon on a piece of aluminum foil. 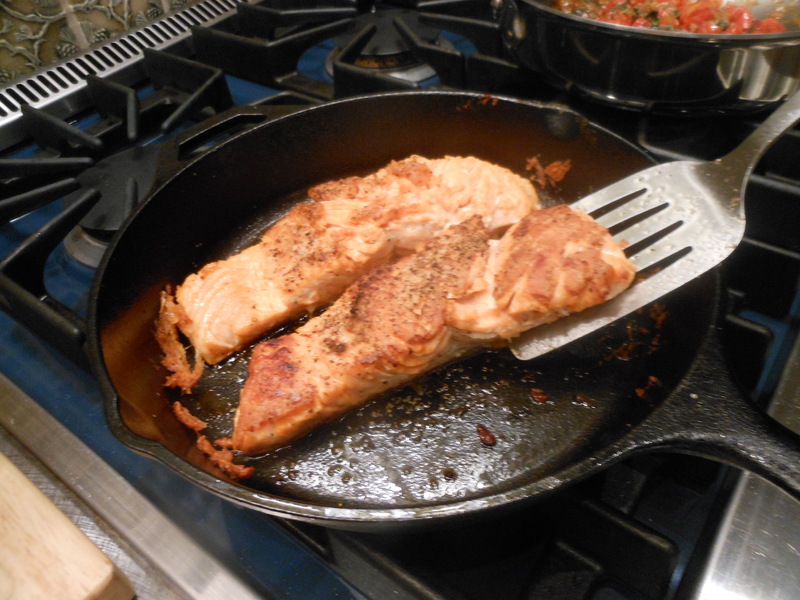 I just cooked it for about 15 – 20 minutes till the salmon was flaky, and the center was just cooked. You don’t want to over cook it. If you’re placing right on the grill it will cook much quicker. When you finish cooking, remove from grill and serve with some of the remaining marinade as additional sauce. This is delicious with rice and a vegetable. 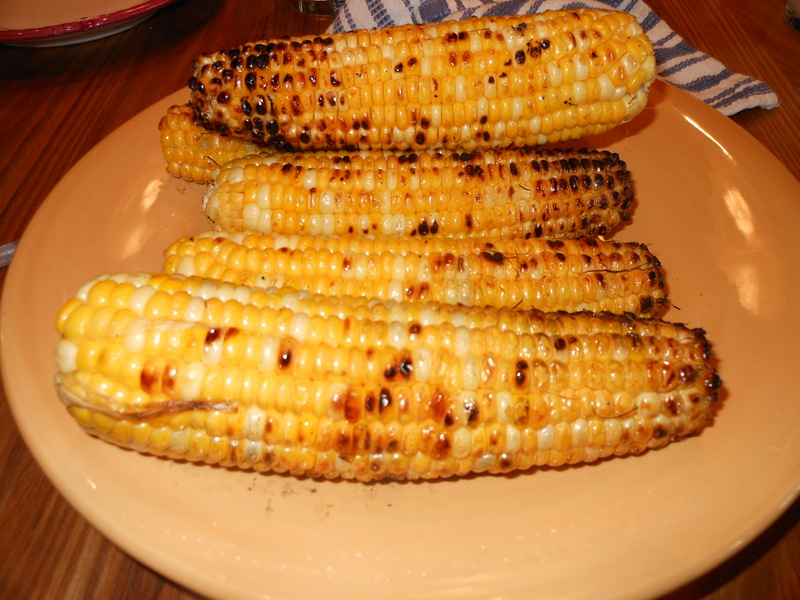 I served with a side of some leftover grilled corn which I turned into a lovely side dish. I used 4 ears of corn, you can use 4 cups of any kind of corn . I just happened to have had some corn leftover from a barbque. * 1 Jalapeno pepper – seeded and minced ( make sure to remove all seeds if you don’t like spicy) you can omit all together if you don’t like the flavor . I love it. This was really a throw together, but it came out so good!!!!! Allow the ingredients to blend for a few before serving. Enjoy!